Thinking about Gulp ➕ WordPress? Wait! You need not to worry even for a single second because Ahmad Awais has built the most intuitive toolkit for Gulp integration with WordPress. It is called WPGulp and it is the most popular WordPress + Gulp workflow that helps you start building WordPress themes and plugins. Thinking about Gulp ➕ WordPress? Wait! You need not to worry even for a single second because Ahmad Awais has built the most intuitive toolkit for Gulp integration with WordPress. WPGulp as he calls it is the most advanced & extensively documented Gulp WordPress workflow which you find in the WordPress ecosystem. While using it you can kick-start a build-workflow for your plugins and themes with Gulp right away. ‍ Used by over 25,000 developers.  About 3,800 projects depend on it. Ahmad is an incredible open-source Developer Advocate who spends more than 50% of his time building FOSS (free and open-source software) products. Being his wife, I’ve closely observed him leading an open-source lifestyle which is quite a difficult task to do. Maintaining WPGulp during all this time was quite critical since several dev-projects were relying on this piece of software. But thanks to our amazing companies/individuals who have been constantly supporting our work. With this generous backing, we’ve been able to launch, update, and maintain this FOSS project and today I feel great to announce that WPGulp v2.5 is here and it just got a lot better. The base functionality of the project still remains the same which includes live reload with BrowserSync, Sass to CSS conversion, Watching files for errors and so on. But Ahmad has worked around really hard to bring the following non-exhaustive list of features in the new release. WPGulp is a free and open source software. Since it has been extensively documented just head over the to its official GitHub repo  the repo and read the docs. I’m sure you get everything out there. Open terminal and Install WPGulp’s node dependencies by running the npm install commands in the root folder of your WordPress plugin/theme. Just 2-steps and boom! It couldn’t be more simple and easy than this. Moreover, the logo/featured image also went through a re-design and TBH it looks great. 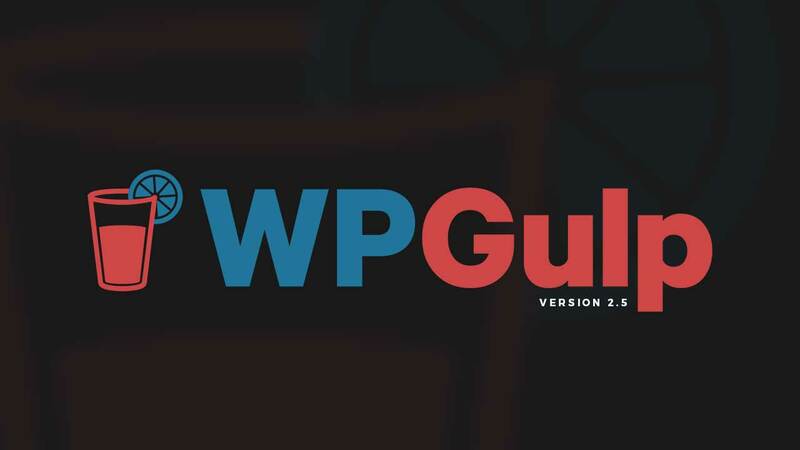 WPGulp is a free project which is inspired by the work of many awesome developers especially those who contribute to repos like Gulp.js, Babel, and many other dependencies as listed in the package.json file. WPGulp v2.5 is an excellent primer for getting started with Gulp in your WordPress development projects. It contains all those tools which a competent developer will be able to pick up the ball and run with it. What are you waiting for? Start using WPGulp today and share your feedback with us. Don’t forget to the repo and Tweet about the all-new WPGulp v2.5. Just landed on your blog and I would say your design is top notch. Glad you liked it. It’s a custom theme which I am currently using on my website.